A drumstick is a drumstick, right – a lovely, juicy bit of chicken leg on the bone? Wrong. In many parts of Cape Town, a drumstick refers to a baguette or French bread (a long, narrow loaf of bread). When you think about the shape of this bread, it’s easy to see why people thought it was indeed the shape of the sticks you use to play a drum. Another local term that might prove a bit foreign to newcomers is gatsby. A gatsby is a big piece of French bread cut open and stuffed with a variety of (unhealthy, cholesterol-inducing and delicious) ingredients such as cheese, polony and chips (hot chips or “slap” chips, not potato crisps). Although some people believe that the name originated from the well-known novel The Great Gatsby, the link is not clear. Gatsby ingredients depend on the customer, but a gatsby is not a gatsby without slap chips. This essential ingredient adopted its adjective because of the soft texture of the chips (slap is Afrikaans for “soft” or “floppy”, but in the combination “slap chips” it’s now widely used in South African English). 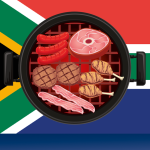 A big part of living in South Africa is inviting a few friends around and having a braai (from the Afrikaans word meaning “to grill”) or a shisa nyama (from isiZulu ushisanyama “eating place”, isiZulu/isiXhosa inyama “meat”). Barbequing, most South Africans feel, should really be left to the people overseas. And finally, we could not end this dip into tasty South African food words without a nod to runaways (highly flavoured, grilled chicken feet) and walkie talkies (runaways eaten together with chicken heads and giblets). The connection between the names and what they refer to is quite clear. South African English is full of wonderful, colourful expressions and words to explore – stiek yt, raak wys and get to know a few more! What a delicious and well-seasoned article!